We recently dropped down to one nap a day around here (Quinn, I mean, not me). Which means more awake time......which means I usually scramble for activities to round out Quinn's day. 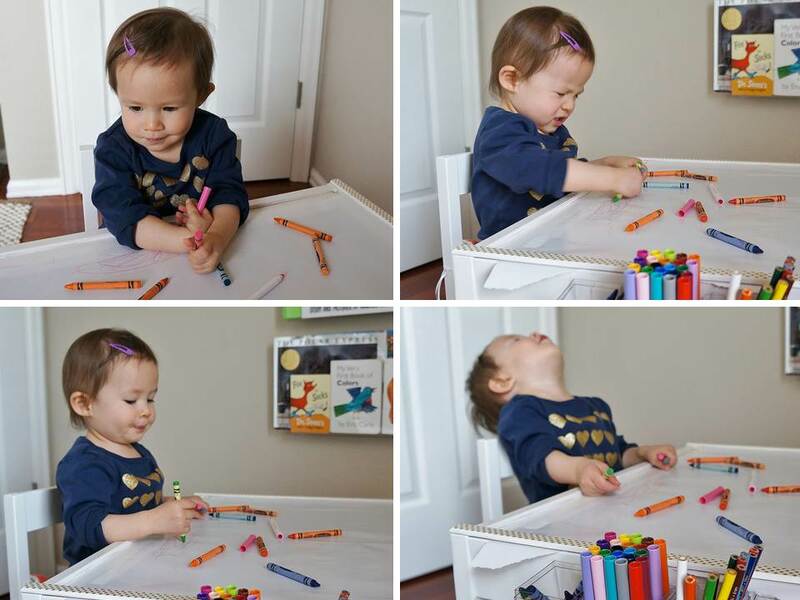 When the library or playdates or playing outside doesn't quite cut it, the art table comes through for us (you know, for the 10 minutes Quinn tolerates it). A while ago, I was inspired by this art table project, an Ikea LATT hack. 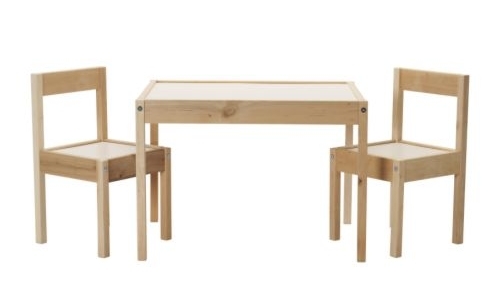 The LATT kid's table & chairs set is a total steal at $19.99. At that price, Quinn can wreak some serious havoc on it & we wouldn't cringe (much). So I showed Husband the inspiration table & he made it happen. A few minutes at Home Depot & $15 later, he was all set to amp up Quinn's art table. Guided by the inspiration table, he free-styled his own version. I couldn't be happier with how it turned out & it's worked beautifully so far. 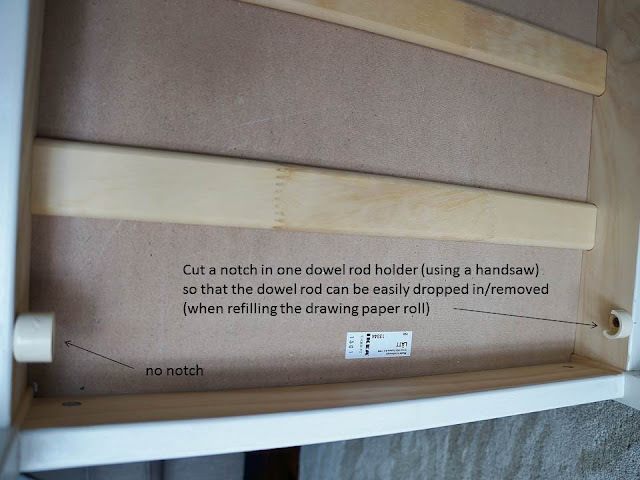 *drawing paper roll (Ikea, Michael's) --->I'm hearing that IKEA's drawing paper rolls might've changed in dimensions so those might no longer fit this table. We've recently cut the IKEA paper roll down to size using a chop saw & it worked! Hope this helps. ETA 12/21/13: our paper rolls are approximately 15.5 inches wide if this helps. This is what we started with. I painted the wood Benjamin Moore White Dove (we have vats of it from when we painted all the trim in our renovated basement), semi-gloss finish. It's great for the wipeability factor. Of course, it helps that all of Quinn's crayons, markers, color pencils, & paints are of the washable variety. 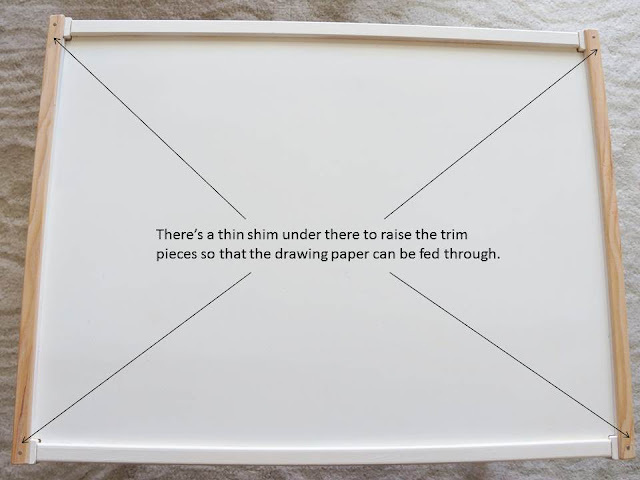 Husband added a holder to the underside of the table for the drawing paper roll. to hold the drawing paper in place. Necessary when you have a spirited artist who likes to flail her crayon-laden hands & finger paint wildly. A bonus is that the trim pieces not only hold the paper in place, but one side also helps w/ tearing off whatever toddler masterpiece was just created so that it can be displayed. These are cheap acrylic containers attached using 3M velcro strips. They work well for now & can be easily removed when there are a few kids around the table, but I'd like to switch them out for a sturdier system eventually. I stuck on a piece of adhesive chalkboard paper (underneath the drawing paper). It's a hit w/ Quinn when she's not trying to lick the chalk. I converted tiny Target clearance pillows ($5/ea) to chair pads by removing some of the filling, stitched them back up, sewed a tuft to the center, & stitched on ribbon ties. Perfect for tiny toddler butts that sit still for 30 seconds. I couldn't leave well enough alone, so I embellished the trim pieces w/ gold dot washi tape (that stuff clings to surfaces so well). I know she's going to mark these up in a hot minute but so far so good. 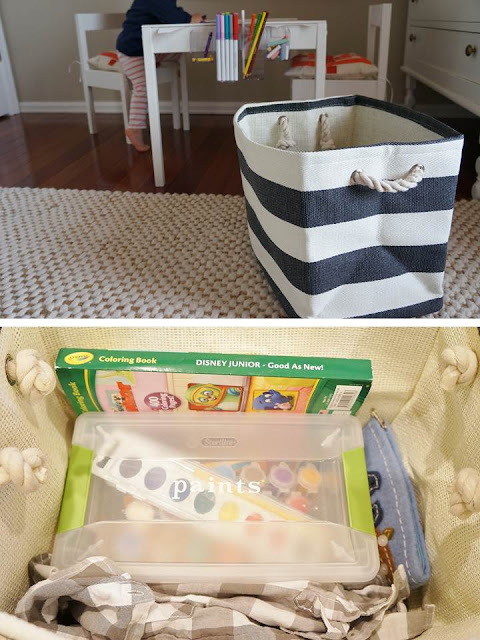 There's a tote for the bigger art supplies. And that is Quinn's art table--fun, functional, & not too precious that it can't face a toddler tornado. It currently resides in her room & will be moved to the basement play area once that space gets pulled together. ............until Quinnie decides her time is better spent pulling her shirt over her head & running full speed, arms flailing, into whatever room happens to be on her itinerary. P.S. I'm too buzzed up tired to watermark my photos tonight, so I thank you for crediting me if you Pin or borrow any of them.